Introducing new exercises to your routine keeps the workouts interesting and effective. It’s the best way to boost your calorie burning and avoid plateaus. Use this front back lunge to give your workout a boost. Trainer Tip: Want to increase the intensity??? Avoid stopping or pausing in the middle, make it one fluid motion. 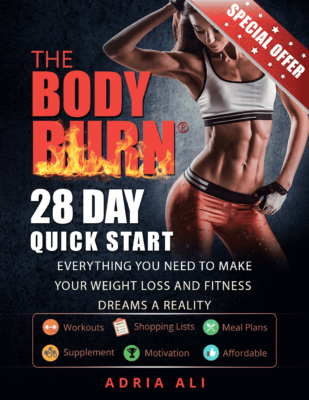 Turn up the burn of this Body Burn exercise by adding weight. You can choose to time the exercise (60 seconds on each leg) or you can count each lunge. You choose! A: Stand facing forward. Step forward with you right leg and preform a lunge (lower your body towards the ground until your knee makes a 90 degree angle). B: Push back up and return to starting position. C: Then take a step back with the SAME LEG and perform a reverse lunge (lunging backwards) Do 16 lunges on each side counting both the front lunge and the back lunge. Keep checking back with us to see weekly exercises such as this front back lunge, fitness tips, diet tips and health news!